The UDB4 UAV Development Board is the latest release of this unmanned tech UAV controller. The UDB4 comes populated with a dsPIC33FJ256 CPU, MMA7361 three axis accelerometer, dual axis IDG500 gyro and a single axis ISZ500 gyro. The on-board Invensense gyros even have enough vibration tolerance to be used in RC heli and multi rotor applications. 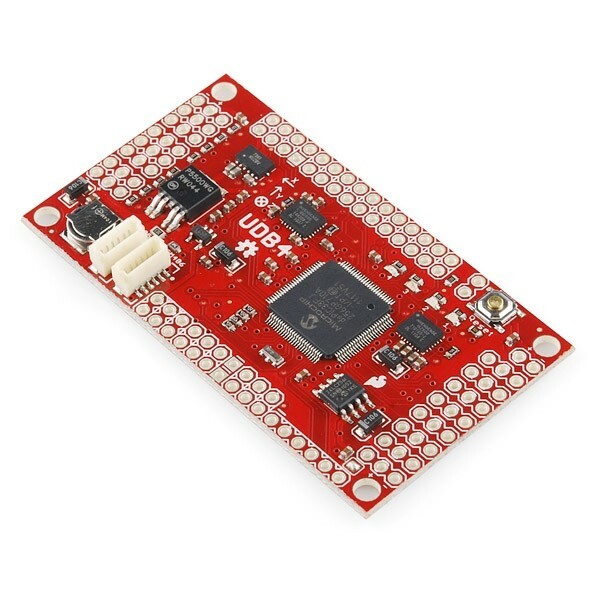 By itself, the board can be used to develop a three axis IMU controller and by adding one of a number of GPS units MediaTek MT3329, EM406 or D2523T GPS receiver, it can be used to develop a UAV controller for a number of applications like RC cars, planes, helicopters, multi-rotor copters or boats. The UDB4 comes with a self-testing firmware that can serve as a starting point for you to develop your own control and navigation firmware. There is a fully functional and open source autopilot firmware available here. The reset button has been removed in order to prevent in-flight resets (not good). The PCB hasn't changed, however, so if you like, you can still add a reset button to the pads left on the board. The UDB4 UAV Development board team have been hard at work and have started into the world of multi rotor flight, the YouTube video above is the first tests of this new application of the UDB4, this will be one to watch as the project gains momentum! UPDATE: Matrix Pilot 3.2.1 has been released! Note: For programming, we recommend the PICkit3. The store provides best products and delivers them in a blink of eye, best and safe delivery.The board is a good choice to develop an autopilot system. PIC, gyros and accelerometers work great to acheive a stable flight. It is feasible to purchase .It is easy to install in any plane because of its size and input/output ports. I like the service from this company, good customer service and prompt delivery.